Does any dish go better with lazy weekend mornings than pancakes? 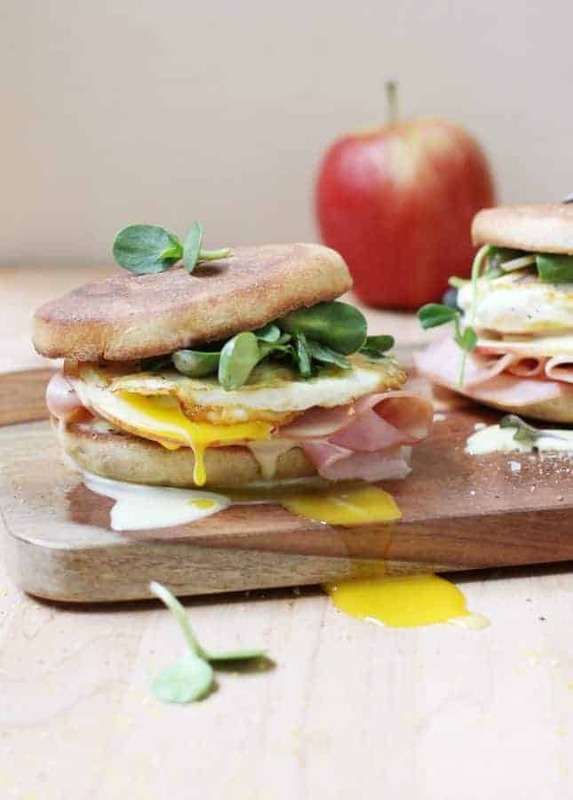 Easy to prepare, quick to cook, fluffy as clouds, and as versatile as your imagination, they’re quite simply the perfect morning food. I’ve made my share of pancakes over the years, trying new recipes as I went, taking notes when adding some ingredients improved the classic recipe, and I’ve recently settled on a new favorite. Adding ricotta to pancake batter makes them extra fluffy, adds an enticingly rich, milky taste, and lends a sumptuous custardy texture to the pancake centers. Now, why wouldn’t you want your pancakes to taste this luxurious, forever and always? My point, exactly. So from now on, these ricotta pancakes should be your go-to pancakes. You can serve them any and every way you like, sprinkled with chocolate chips and banana slices, slathered with hazelnut spread, or doused in maple syrup. 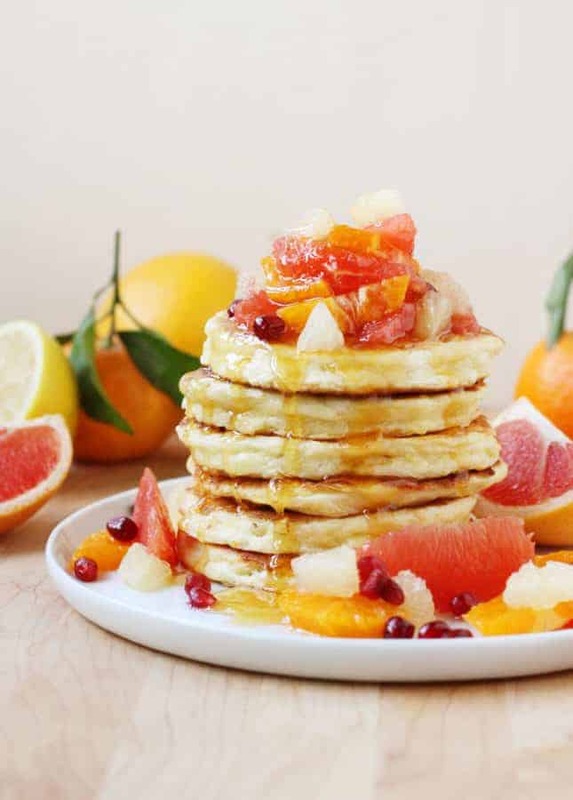 But if you want to turn these ricotta pancakes into an extra-special dish, use your own homemade ricotta in the batter and serve the pancakes with a tumble of citrus fruit segments and a drizzle of citrus syrup. Granted, assembling the dish will squeeze a bit more effort out of you, but ricotta and citrus fruits are made for each other. Believe me—you don’t want to miss this sweet combination! Zest the citrus fruits using a Microplane (the citrusy aromas will wake you right up!). 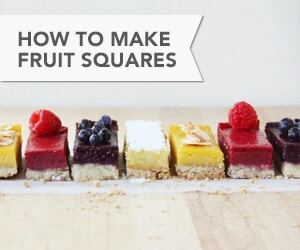 Peel and then chop or segment the fruits (see recipe, below, for prep tips); set the pieces aside. Squeeze citrus juice for the syrup and add to a saucepan along with the syrup’s sugar. Prep the pancake batter, then start cooking the pancakes. Boil the citrus syrup while the pancakes cook. 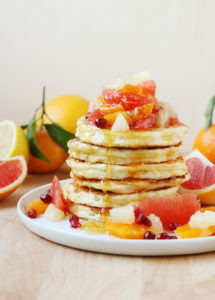 Pile the pancakes and citrus fruits as high as you can, drizzle generously with syrup, and enjoy! All in all, the process should take anywhere from 35 to 45 minutes, or just long enough to allow you to sip your first cup of coffee. Shopping Note: To make this recipe, you will need 2 pink grapefruits, 3 oranges or 6 clementines, and 2 lemons. These ricotta pancakes are extra fluffy, with an enticing milky taste and a custardy texture. 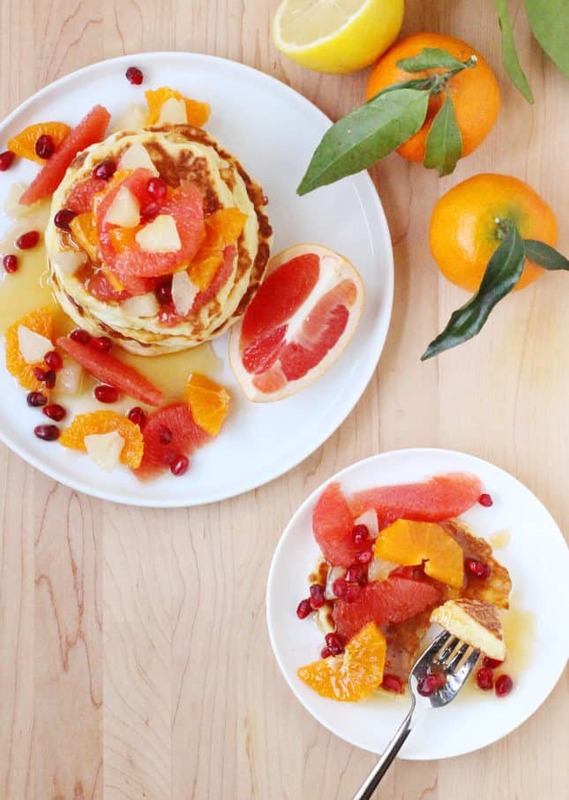 The citrus fruit topping will brighten your breakfast table! Using a Microplane, zest the citrus fruits you will use for the topping and set aside 1 tbsp (15 ml) packed mixed zest. For the citrus fruit topping: Cut off both the top and the bottom of the citrus fruits. Stand one fruit on either of the flat ends. Run a very sharp paring knife along the fruit from top to bottom, removing the skin and pith, leaving the flesh bare. Repeat for all citrus fruits. Now you can either slice or segment the citrus fruits. To slice the fruits (easiest method): Turn the peeled fruits on their sides and slice them into rounds. Either leave them as whole, round slices, or cut again in halves or quarters. Transfer the prepared pieces of fruit in a bowl and set aside until service. To segment the fruits (more elegant presentation): Take a peeled fruit in one hand, and carefully run a sharp knife alongside the membranes, leaving entirely bare pieces of fruit behind. You should make sure to do this over a bowl and squeeze the remaining membrane to catch all dripping juices, which you can use to make the syrup. Transfer the prepared pieces of fruit in a bowl and set aside until service. Prepare the pancake batter: In a large bowl, whisk together the flour, baking powder, sugar, and salt. 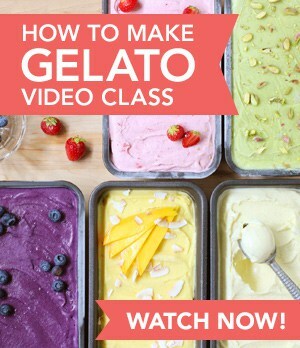 In a separate bowl, whisk together the ricotta, milk, egg yolks, citrus fruit zest, and vanilla. Pour the ricotta mixture over the dry ingredients and stir gently, using a spatula, until just combined. Using a stand mixer fitted with the whisk attachment, or a hand mixer, beat the egg whites until stiff. Using a spatula, stir a scoop of the egg whites into the pancake batter to lighten the batter, then add in the remaining whites, gently folding until no white streaks remain. 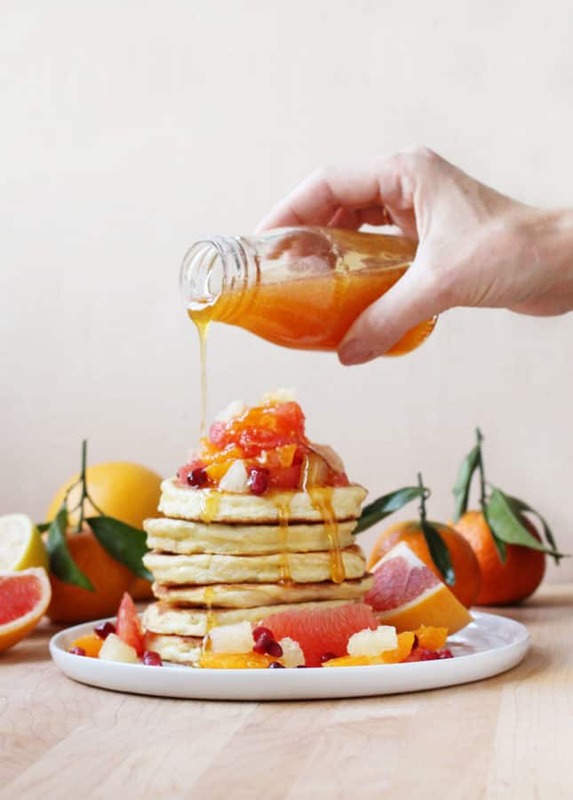 Cook the citrus syrup: Combine the citrus fruit juice and sugar in a small saucepan. Set over medium-high heat and bring to a boil. Lower the heat to simmer for 8 to 10 minutes, or until the citrus has thickened to a maple syrup consistency. Transfer to a serving cup or glass bottle and set aside until service. Cook the pancakes: Heat an electric griddle to medium, or a large nonstick pan over medium heat. Lightly grease the cooking surface with cooking spray. Use a 1/3 cup (80 ml) measure to pour batter onto the hot griddle or pan (use a spoon or a narrow spatula to help the batter out of the cup, if needed.) Cook the pancakes for about 4 minutes, until the undersides are golden and you can see a few bubbles popping through the pancakes. (If the underside of the pancakes seems to be browning too quickly, lower the heat.) Flip the pancakes and cook for another 3 to 4 minutes, until the pancakes are golden, puffed and cooked through. Repeat to cook all pancakes. If desired, set the cooked pancakes on a baking sheet and place in a low oven to keep warm until service. SERVING: Pile the pancakes on serving plates. 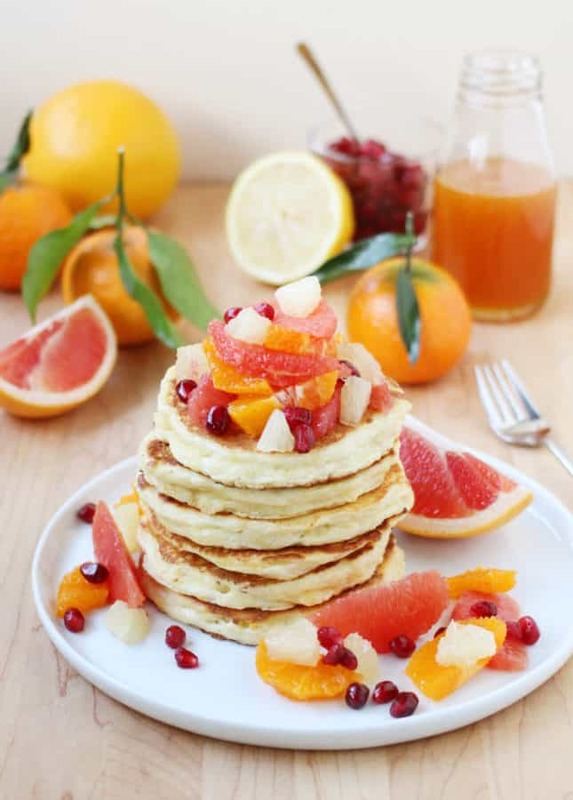 Top with pieces of citrus fruits. 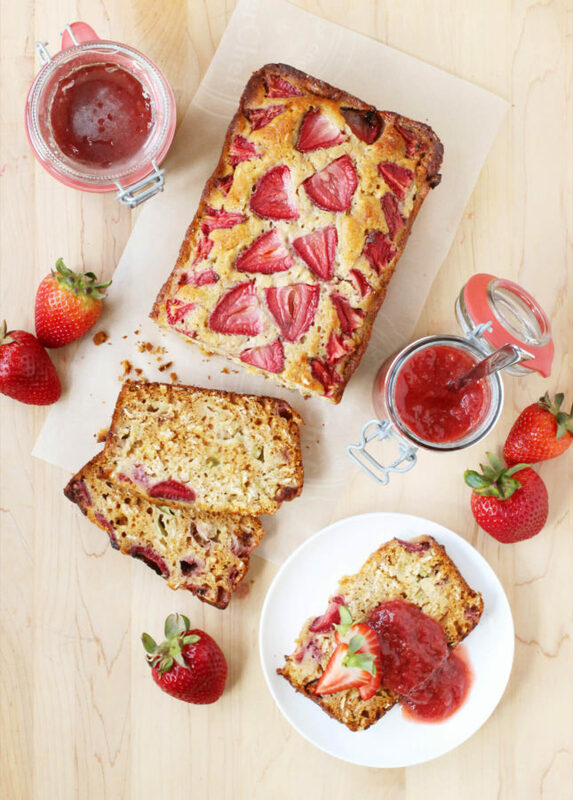 Generously drizzle with citrus syrup and serve immediately. The cooked pancakes will keep refrigerated in an airtight container in the refrigerator for up to 3 days. To reheat the pancakes, set on a baking sheet and place in a preheated 300°F (150°C) oven for 8 to 10 minutes. The citrus syrup will keep refrigerated in an airtight container or glass bottle for up to 1 week. Gently rewarm the syrup in the microwave or over low heat before serving. Recipe Credit: Marie Asselin, FoodNouveau.com / Basic ricotta pancake recipe adapted from The Kitchn. Looks delicious!! 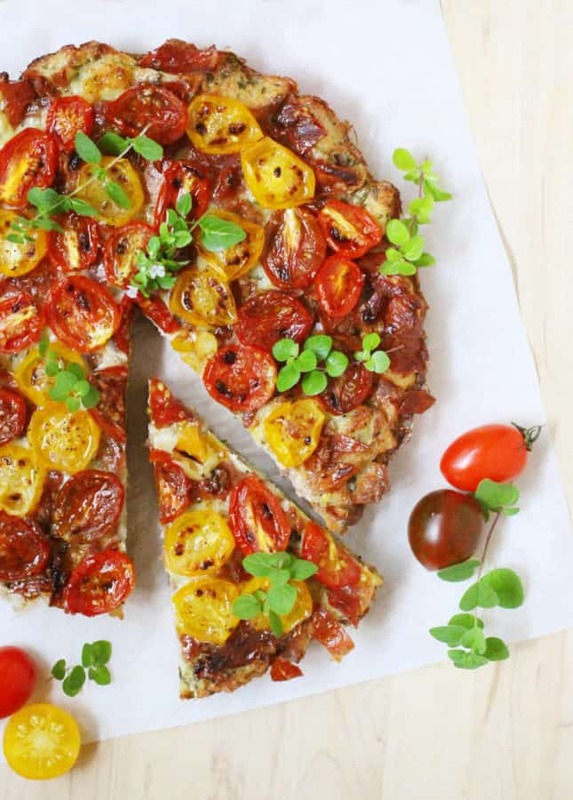 I’d love to have found this during summer time, but I’m sure it’ll just as delicious now!